Made for all you make-up mavens! Get rid of that weird oil slick, the raccoon eyes, and the mess involved with runny liquid formulas. bliss lid & lash wash makeup remover is much more 'gel'-icate, innovative and effective. Now that’s beautiful! Remove your make-up like a pro with bliss lid & lash wash makeup remover. The oil-free gel formula removes even waterproof mascara and its non-irritating composite is safe for sensitive souls, and if you wear contact lenses. 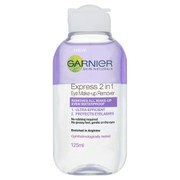 Oh, and a little goes a long way – this make-up remover lasts! Before cleansing, apply a small amount to a cotton pad. Start with the upper lid. With a few gentle swipes, mascara, eyeliner, and eye shadow will disappear.